There are two kind of bands stemming from the Electropop camp. One camp seeks to emulate the sound and feel of Depeche Mode’s best records as much as possible. The other part of the Electropop-Camp however decided to walk a less beaten patch. This includes SPECTRA*paris, the alternative project of enigmatic Elena Alice Fossi, lead singer of italian cult-outfit Kirlian Camera, and supported by Legend producer John Fryer. Their third album “Retromachine Betty” breathes and lives the spirit of 80ies electronic Pop and Wave and the almost forgotten vibe of bands like Visage or Desireless. A pop-vision constantly changing between neon-blue electronic melancholy and bubblegum-orange sweetness. SPECTRA*paris lean on both, the memory of 80ies pop (Star Bubbles, Alice (Geistersterne) lightness and innocence as well as the DNA of Kirlian Camera, a heavy Electropop darkness (Ludovico Technique, Metrolynx) mixed with the grandeur and electronic club-induced melancholy that constituted the “Electro-Wave” underground sound of the 80ies. And therefore “Retromachine Betty” becomes a time-machine into revisiting our own youth, the school-trip to the youth hostel, or our first visits of DISCOs and underground clubs with beating hearts in a non-legal age without our parents knowing about it. 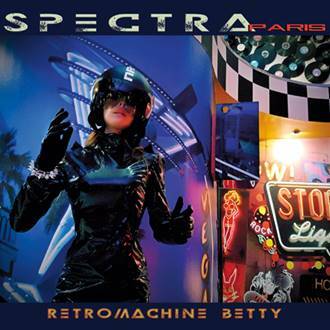 A retrospective of excitement and familiarity, old memories and young melodies and with its retro-kitsch catchyness that makes “Retromachine Betty” a truly unique Electropop experience.